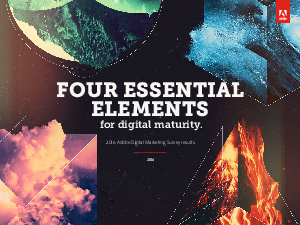 > Adobe > Four Essential Elements for digital maturity. We make it our duty to understand all aspects of digital marketing. For seven years, we’ve surveyed hundreds of marketers worldwide to learn how companies are maturing digitally. We’ve summarized the findings of our 2016 Adobe Digital Marketing Survey in our guide, Four Essential Elements for Digital Maturity.